Yeah, I fell off the earth I know. In my defense I've been reading all of your journals pretty much every day, but with a small child and life, the universe and everything there's been precious little sewing going on and even less writing about it. But here they are, in all their glory! 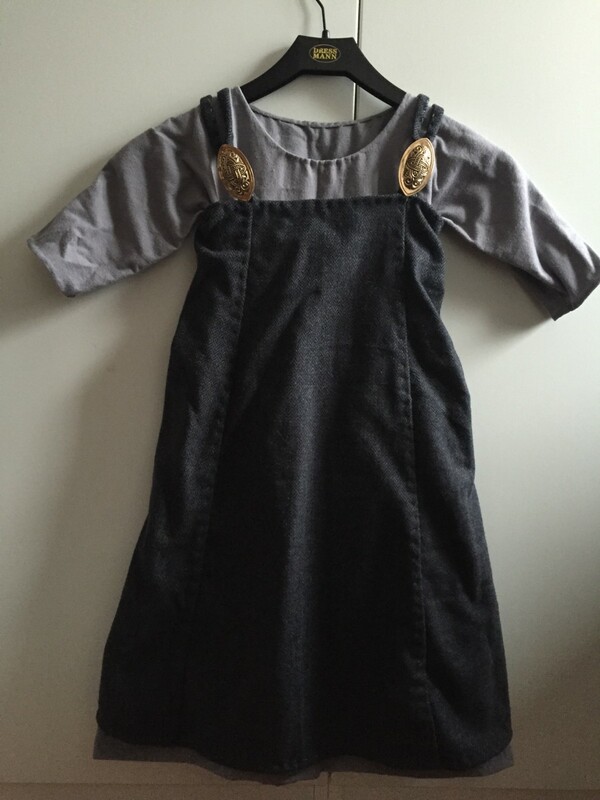 The first, for the January challenge Foundations, is a Viking serk or underdress for Kidlet. It's the softest wool flannel ever, not so period, but I wanted her to have something soft as a base layer. It's all handsewn with waxed linen thread and all seams are felled. It's actually quite a bit longer with a 20 cm deep hem so it will grow with her. Then the smokkr or apron dress for the February challenge, Blue (yes it's blue/grey, but photographs very grey). It's made from scraps from my dress, which happened to have the exact right shapes and proportions (love geometric shapes of early clothes) so no cutting, and best of all, no waste! All handsewn with felled seams. Fastened with tortoise brooches from Historiska Fynd. I lost some momentum after having rocked the embellish challenge. I don't think I've ever finished a dress in two weeks before and I felt really proud. The next two challenges, peasant and accessories, were already written in the stars - the 15th c french working class dress and a matching hood I'd planned for ages. These two I had meant to hand sew, though. Having just finished them this weekend (more on them later), I was determined to get back on track, and instead of the viking apron dress I had planned for the sea challenge due this weekend, I decided to whip up a quick project in order to catch up and finish on time. So I made a cute little viking midnight ocean blue Dublin hood from some wool scraps. By hand, but it only took 2 hrs to cut and sew. I've been meaning to make a 15th C french working class dress for several years, since first discovering it in the ambiguous line drawing in Thursfield's Medieval Tailor's Assistant. Shortsleeved and front-laced, it's not a pretty princess dress but it's very adjustable sizewise, it's great for outdoor events, can be dressed up warm with sleeves and hood if needed, and looks super comfy. And I've become very fond of simpler handsewn garments, beauty in simplicity. When the Peasants and Pioneers challenge came up in the HSF, it was just meant to be! Last fall I bought a remnant piece of a gorgeous blue wool, and have been kicking myself that it was just a couple unfortunate centimeters too short for this project, but then I realised that I could just add a scrap piece at each shoulder without it looking too weird, and after all, piecing is period! To accessorise it I will make the ubiquitous red hood and a tasseled pouch, and I already made the tailed cap for the first HSF starter challenge. Here's the rest of my Pinterest album of inspiration. 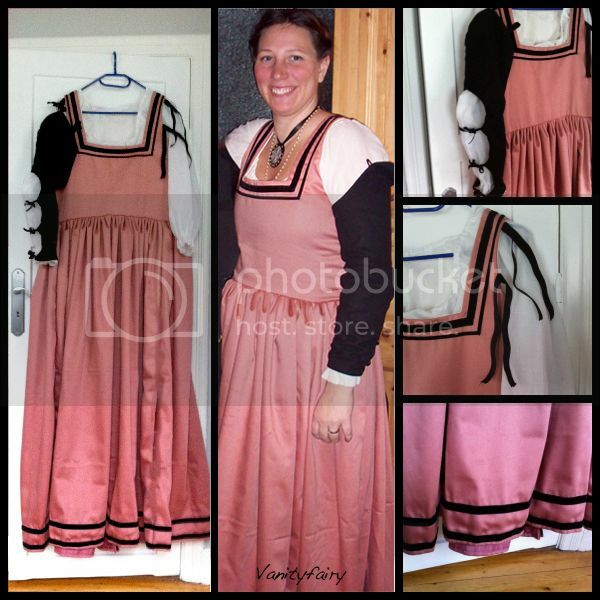 The skirt is 4,5 meters wide and cartridge pleated to the bodice. 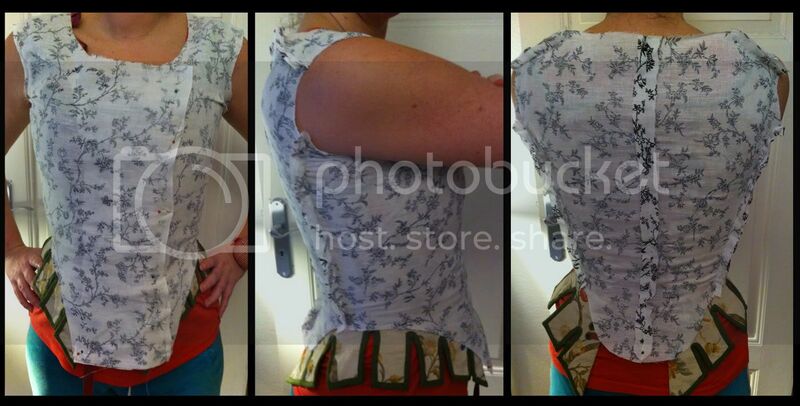 The bodice has two sturdy interlinings and linings (from another old curtain(!)) and I think I got away with not using hemp cording since the skirt is quite heavy and I'm wearing a flattening sportsbra. The wool sleeves tie on using velvet ribbons, but can be left off, and then the ribbons fly free a la Campi's fruitseller. Those ribbons and my real camicia/shift are missing in the "wearing" picture. Onwards and upwards! I have started up a new multipurpose shift for the Underwear challenge, and was planning on starting the Kampfrau for the Peasant challenge. But then I realised that the event I'm going to at the end of Feb is indoors and both the kampfrau and flemish may be too hot. So I thought I might pick up an old de-stashing idea and make a Pink Florentine. I have tons of pink curtains from my mother in law, and because the bottom of the curtain is hemmed the skirt will be really quick, and the velvet ribbons could pass for the Embellish challenge. Now I just can't decide whether to go with my original plan to make it smooth front with side lacing (will need a new pattern re-worked from flemish) or to use the front-closing pattern I made for the upcoming Kampfrau (would be good to try out it out with free fabric, but I don't think it's as pretty). Mainly all sewing was done during the summer. The handsewn viking jacket took ages so in all fairness I did do quite a lot of sewing in the summer months. I started out on a few other things that are now in the UFO pile though - a 16th C Kampfrau, a new shift, an underbust corset and some 18th C stuff. I also tried to teach myself Nålbinding, with limited success so far. 2013 - the year of FOCUS! I'm really going to give the Historical Sew Fortnightly a try this year! I need challenges and deadlines, and I hope this will give me some momentum, and hopefully also get me to log it. All of them are handsewn. There's a new challenge due every other week, but they're announced 7 weeks in advance so you can use as much time as you want, and make as many or as few as you want. #0 (the bonus challenge): Starting Simple - due 31 December. A hand sewn linen 15th C long tailed cap, see further down in the post. #1: Sew something from __13 – due 14 Jan.
#2: UFO - due Jan 28. Hell yeah! I have loads of unfinished stuff. Maybe the flemish? #3: Under it all – due Feb 11. #4: Embellish – due Feb 25. #5: Peasants & Pioneers – due March 11. #6: Stripes - due March 25. #7: Accessorize – due April 9. 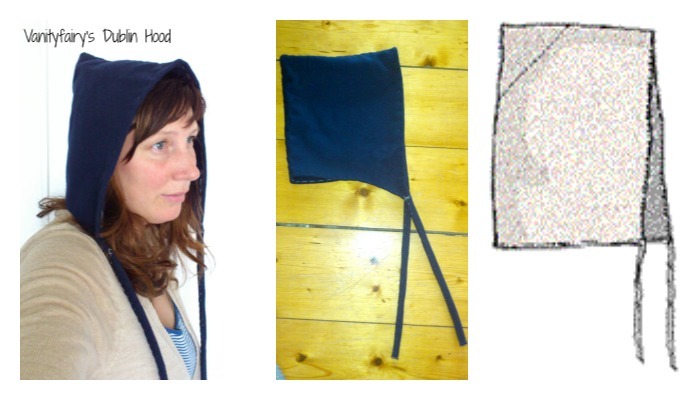 For the first Bonus challenge I made a 15th C long tailed cap, hand sewn with waxed linen thread. Historical accuracy: To the best of my ability. Hmm, yes, hi, I'm alive. Fortunately I didn't set any written in blood goals for 2011, only listed a few hopes, two of which I actually made, and then some other few tidbits for our Tolkien society event Bokskogen and some baby stuff (none of which I ever posted about, sorry, but it's coming). 2012 - the year of DOWNSCALING! I'm really going to lower my own expectations this year! However, we do have a jubilee for the Tolkien society so I'm hoping to crank out at least one fancy costume each for Jo and me. With my lack of updates you'd be guessing that nothing's getting done over here, but that's actually far from the truth, I've just devoted my precious time to sewing instead of updating. At this point the lining of the jacket is done, meaning that the patterning has been tweaked and adjusted into perfection for the outer fabric. I did make a muslin first, this was based on a slightly altered version of my trusted 18th C bodice pattern. The fit worked well, so then I went ahead and made some changes to the pattern to get the characteristics of the jacket - the overlapping front bodice with a wider CF bottom, the small skirt at the back, and slightly higher neckline etc. I tried that on the lining straight away since they weren't major changes and I do have plenty of that fabric. This was last weekend and all was hunkydory. Then came monday, bringing teh Sleevils. Sigh. My first (ever) attempt at making a twopart long sleeve turned out awful. The angle at the elbow was too small and the width was too generous and the whole thing fit horribly into the bodice armscye. So on tuesday night I started drafting a new pair, a Franken-pattern that is based on the onepart short sleeve that I'd previously drafted to use with the original bodice (because then at least I knew it would fit into the scye), with a lot of guesswork and trying to imitate the twopart sleeve for the pierrot in "Kvinnligt Mode". The good thing is that I can now use this sleeve pattern for when I make that pierrot, in some other life. I first tried out that new sleeve pattern by pinning the pattern (drawn on a plastic bag) on my arm, and after that made it up in the lining fabric. It worked out great. 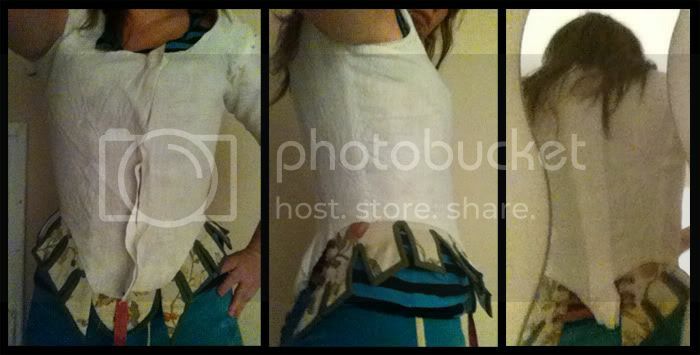 Now they are attached to the bodice and I'm ready to get started on the striped silk outer fabric. In between, I've also worked on a little fichu, just a triangular piece of cotton voile that I've hemmed by hand while watching telly. Right, when I summed up the year it seemed like there were quite a few projects that I never showed you guys pictures of, so I'm gonna get right on to that. The 16th century flemish ensemble isn't technically finished, since the overgown still needs a few eyelets and a hem, but I, being clever for once, made the kirtle of wool too, so both can be worn as outer garments, meaning the kirtle and co have actually been worn to 3 events already. Everything is handsewn with waxed linen thread.